I opened two amazing gifts this morning- my eyes!! …If you did too, take a moment today to appreciate the day! This life is FULL of curveballs, ups, downs and the inbeteeen can be trying as well. It is not easy, but making the effort to REMEMBER your blessings when you’re feeling down and out can make the challenges more bearable. How can you do this? It takes practice. Next time something comes up during your day that feels negative or makes you upset or mad, it’s important to address these feelings, but don’t stay there. For every one bad moment in our lives, we have 100 more to be grateful for. I’m going to start with the obvious, but something I know I take for granted- if you’re able to read this, you’ve already been able to list one thing to be grateful for. 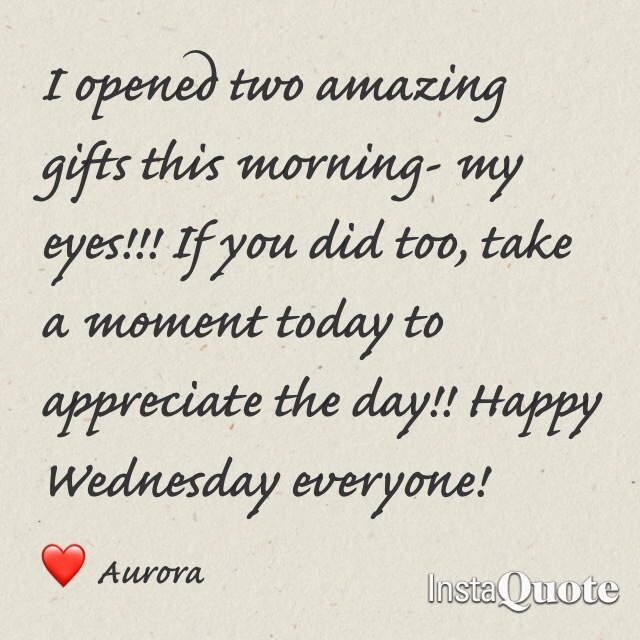 Happy Wednesday friends! What gift do you have that you’ve taken for granted?